Using keyboard shortcuts can really help speed up your Lightroom workflow. For instance, it’s super annoying when you’re using the spot removal tool, to have it keep selecting the wrong area to sample from. You’re trying to remove a pimple from someone’s chin, but instead of selecting an adjacent skin area to sample from for healing, Lightroom picks their lip. But a quick hit of the “/” slash key will tell Lightroom to choose a different area. I’ve got tons of additional shortcut keys for both Windows and Mac listed in this free cheat sheet. Just download the pdf, print it out and keep it near your computer. 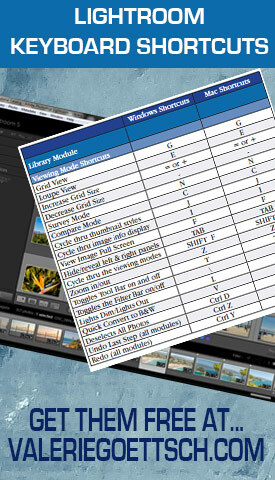 There are tons of shortcuts, in fact there’s one for almost everything in Lightroom. But I deliberately listed just the most-used ones because if you have to search through 10-12 pages of obscure key combos to find the one you want, it’s not exactly a time-saver, and that’s the whole point, right? Having said that, is your favorite shortcut missing? Tell me in the comments below and I’ll add it to my list.